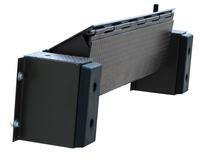 The Edge-O-Dock Dockleveler permanently attaches to face of your dock, providing immediate use while saving valuable floor space. These levelers never get lost or stolen and they eliminate pinched fingers and toes. The Mechanical spring counterbalance Edge-O-Dock is operated by hooking the lip and lifting until the tip of the lip clears the bed of the trailer. With an outward lifting motion the lip is extended and the dockleveler is lowered to the trailer. When the trailer departs the lip retracts behind the bumper face automatically. Units comes complete with bumpers and hook. The Hand Pump Hydraulic system eliminates manual lifting. The hand pump is used to lift the deck and extend the lip. The operator rotates the relief valve allowing the deck to descend down and rest upon the trailer. When the trailer departs the lip drops automatically behind the face of the bumpers. Unit comes complete with bumpers, hand pump with bracket, cylinder, hydraulic lines and oil. The Electric Hydraulic Edge-O-Dock (1/3 H.P. 115V) is the easiest to operate. After the truck is backed against the dock, push and hold the control button. The ramp raises and the lip will extend and rest on the truck bed. When the truck departs the lip retracts behind the bumpers automatically. Control Panel Mounted Inside Dock (Pic. 4). 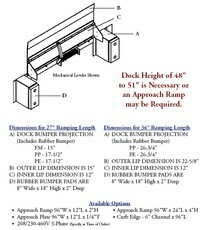 NOTE: A STEEL DOCK EDGE, OPTIONAL APPROACH PLATE OR APPROACH RAMP IS REQUIRED FOR PROPER INSTALLATION. **Overall width is usable width plus 26"